Last weekend saw the Southbank centre host Nordic Music Days, a four-day festival which formed the climax of its year-long celebration of nordic arts and culture, Nordic Matters. Comprised of over 40 free performances and workshops, many of which took place in public spaces, this was a festival designed with maximum accessibility and interactivity in mind. The clearest example of this was Paul Jefferies’s Northern Lights Musical Sculpture, a playable instrument-installation on the Riverside Terrace. Aiming to embody the cross-cultural exchange taking place at the festival, the sculpture consisted of a pyramidal frame hung with a sheet-metal representation of the aurora borealis and kitschy replicas of London landmarks. This rather basic design did succeed in getting members of the public to play music together, but it was disappointing to find that despite Jefferies’s experience as a percussionist, most of the sounds created when playing the sculpture were no more interesting than the ones you might get from drumming on your average cardboard box or radiator. What appeared to be carefully-tuned glockenspiels hidden inside models of town houses, delivered no more than a dull thud when struck. The most acoustically appealing section of the sculpture was a model of Tower Bridge made with guitar strings, attached to an amplified metal plate which, when plucked, created an overtone-rich rasping sound. The highlight of the festival’s exhibitions was the Virtual Orchestra: Sibelius 360, the second in a series of immersive virtual reality experiences recently programmed by the Philharmonia. VR may be seen by some as a gimmick, but in the hands of their tech-savvy artistic director Esa-Pekka Salonen it was a genuinely arresting experience. 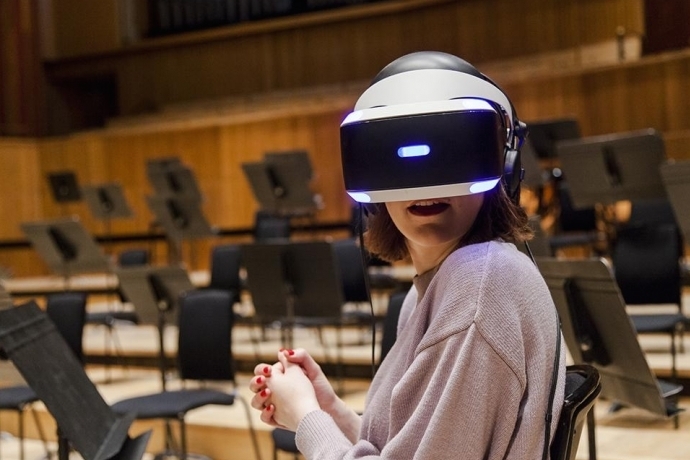 After a brief introduction from the conductor, my VR goggles whisked me onto the stage of the Royal Festival Hall, among the front desks of the strings just as Esa-Pekka gave the downbeat of the finale of Sibelius’ Fifth Symphony. While the audio quality was not excellent, I was transfixed throughout by the orchestra’s playing, observing, at this unusually close proximity, the musicality of their gestures and their almost imperceptible cross-sectional communications. Classical music, like all other long-form art, faces the challenge of making itself relevant to a generation accustomed to consuming culture online and in bite-size formats, but experiences like Sibelius 360 present excellent entry points for people who wouldn’t otherwise dream of stepping into a concert hall.